By	Marios Alexandrou on June 9, 2018. What Do You Do With An Unsupported Tablet? Not too long ago I scored an HP Touchpad for a mere $100. You may recall that back in 2011, HP decided to get out of the tablet business and kicked off a fire sale of all of their remaining inventory which, I might add, sold out immediately. I was fortunate that my brother had a friend working at HP and eventually he was able to get a few of the highly coveted devices. The first thing you might wonder is what am I going to do with a no longer supported tablet? Well, at first I thought someone would pick up the now open-sourced WebOS and continue to improve it. This in turn would attract app developers. Alas, that doesn't seem to be what's happened. Luckily a better solution emerged in the form of Google's Android. It turns out that the HP Touchpad was originally designed to run Android, but when HP bought Palm they changed directions and switched to WebOS. Another bad decision it seems. 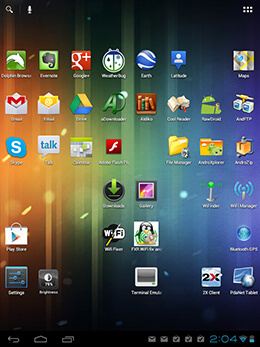 A group of developers created Cynanogen Mod, a repackaging of Google Android for multiple devices including the Touchpad. Cynaogenmod v7 is based on Android v3 while Cyanogenmod v9 is based on Android v4. Both are supported in parallel, but v9 represents the future and so that's the version I grabbed to install. The best instructions I found are here — they really are easy and the whole process takes easily less than 30 minutes. I now have an Android-based tablet which pretty much works like my Android-based phone. I'm one happy camper! The version of Cyanogenmod I used was still in beta. From I could tell it was fairly stable, but there were still some bugs. The biggest is that the camera doesn't work. I expect the bug will be corrected in the final version, but since I don't need to use it I'll be fine either way. After about a month using the Touchpad, the wifi connection started to behave strangely. Networks were detected and I was able to initiate a connection request, but the connection wouldn't take. Rebooting didn't help. A little digging on the web revealed two solutions. The first was to delete everything in /data/misc/wifi/ using superuser access in a terminal window. Curiously, the wifi folder, for me, was read-only. And being a little nervous to delete files, I decided instead to just rename everything. That did the trick! Well, at first anyway. The next day I had the same problem. So I started to look around the Google Play store. It turns out the problems with wifi on multiple devices are common. Two apps emerged as potential options. The first, Wifi Fixer, addresses a different problem (intermittent dropped wifi connections) and so it wasn't of use to me. The second, FXR Wifi Fix and Rescue, managed to correct the issue I was having. Unfortunately, it too was temporary so I'm now running it regularly. While the app is easy to use, it does result in me having to re-enter my router's password — I guess part of the fix is to delete with wifi profiles. The HP Touchpad isn't a mobile phone and so a connection to the Internet is possible only if there's wifi available. In addition, it doesn't come with a built-in GPS. Those two issues combined might make think that using Google Maps isn't possible. Well you'd be wrong, of course. Why else would I be writing this!? What you'll need to do is download PDANet to your phone and your Touchpad. Then pair the two devices via bluetooth. This'll give your Touchpad internet access via your phone's mobile connection — good for getting maps while on the road. Next, download Bluetooth GPS to your Touchpad. When this is activated your Touchpad will be grabbing the GPS signal from your phone. So now you have a GPS and internet-enabled tablet for wherever you go. Do not that your phone battery will be drained faster with it providing both GPS and internet access. The rest of the Android app market is available to you. Install your favorite email and instant message app. Grab whatever social apps you want too. For reading books I recommend Aldiko (for epubs) and Cool Reader (for mobi) — I prefer epubs myself. I also installed the Dolphin Browser (why isn't there a Google Chrome for Android!? ), Evernote, and Weatherbug. And now that you've got a tablet that is actually worth carrying around with you, consider getting a case for it. The good folks at HP had at the time time of this writing discounted Touchpad cases too — I got mine for just $4.99 and although I don't know what the original price was, my experience with cases for portable devices suggests that it was probably $29.95. That was a sweet deal. And I've now got something I think is as good as an iPad at a tiny fraction of the cost. Can't beat that!